Can Melatonin Prevent Aging in Your Brain? Melatonin is the nighttime hormone that regulates your sleep cycle. It is deeply embedded in the fabric of the human brain and body—and a new study suggests that it could prevent brain deterioration and even Alzheimer’s disease. Researchers in Barcelona found that combining exercise with daily melatonin intake worked together in mice to protect the neurological system. Both are known for regulating circadian rhythm and now, based on this study, they might have important anti-aging effects when combined. The mice involved were in the initial stages of Alzheimer’s and showed learning difficulties and behavioral changes, such as anxiety and apathy. Three groups of mice did exercise (the running wheel), took a dose of melatonin equivalent to 10 milligrams per kilogram body weight, or a combination of the two. Six months later, the mice undergoing treatment were closer to the mice that had no mutations, meaning the Alzheimer’s disease had significantly regressed. Results showed improved behavior, learning, and memory. 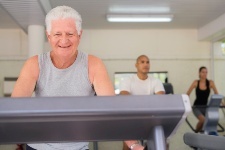 Melatonin and exercise also protected brain tissue from oxidative stress and helped shield it from certain factors that increase the seriousness of Alzheimer’s. Of course, it should be noted that the study was on mice, so transferring data to humans is not always consistent. For instance, a human develops Alzheimer’s over several years so when you start losing memory, the brain has already suffered a great deal. Still, studies have found signs of physical and mental benefits in Alzheimer’s patients resulting from exercise and melatonin. In the absence of drug treatment, we must turn to lifestyle changes, including fitness, eating right, and taking supplements. Melatonin is best known for helping with insomnia and jetlag and, to a lesser extent, anxiety. In 2007, the European Union approved melatonin as a medication, which means studies have been increasing. So don’t be surprised if, over the next decade, we start learning a lot more about melatonin and what it can do for us in supplement form.